Our product range includes a wide range of heavy duty grease, high speed grease, silicone grease, high performance grease, extreme low temperature grease and corrosion resistant grease. Release – ON 15 Z Heavy Duty Grease is formulated using extreme pressure and solid lubricating additives with a high viscosity base oil. Appearance & benefits : For lubrication of plain and roller bearing exposed to high load. It reduces friction and wear on mechanisms exposed to high loads and also suitable for low speed bearings and it also lubricates in presence of water. This is a soft, buttery texture release on r880 high-speed grease with special additives suitable for high-speed grinding spindles, spindle bearings, roller couplings, free-wheels and sealed bearings, textile spindles and so on. benefits : reduction of wear. 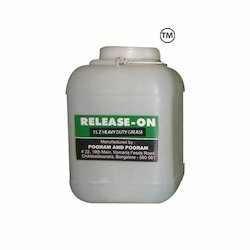 Prolonged lubrication protects against corrosion and provides quiet operation of the machine. 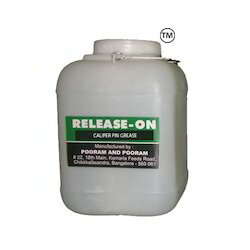 Resists water up to 900 c.
R-900 SVP GREASE is formulated using silicone and inorganic thickener. 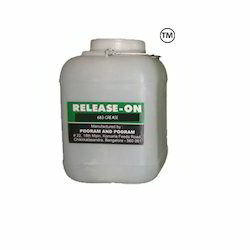 Used as a packing grease, plastic and rubber lubricant. It is also used in water line valve, used in paper industry for open gear applications. It is non-toxic, neutral to plastic, rubber and many metals. It has a good resistance towards solvent and repel water. R-1051 is formulated for lubrication of bearings and sliding parts subjected to high temperatures and heavy load application at moderate speeds. It is resistant to hot and cold water. It is used in conveyor bearings, oven trolley bearings, drier bearings, induced draft fans etc. This is a heavy duty grease and extreme low-temperature grease formulated using MOS2 and graphite and special extreme pressure/anti-wear additives suitable for high load applications. This grease is resistant to aging and protects against corrosion. APPLICATION : For large low-speed rolling bearings subjected to high loads. Ideal lubricant for spherical roller bearings in roller presses, bowl mill, rotary crushers and also suitable for plain bearings. Release – on wr 214 grease which can operate at high temperatures. It has outstanding corrosion resistant properties. Appearance & benefits : it can operate effectively under contact with water. It is used for lubricating ship-board/ship-building equipment, canal equipment, steam cleaning equipment used in bottling plants, and other applications that involve water splashing. It is also used in anti-friction bearing, bearings operating at moderate to high speeds, for lubricating conveyers, irrigation and agricultural equipment, where water contact is a permanent feature. RELEASE OF 683 GREASE is a soft, buttery textured, synthetic, oil-based grease, food grade with special additives suitable for food industry. APPLICATION : Lubrication for metal to metal/ metal to plastic/ plastic to plastic sliding surfaces. For vertical/ sliding movement and for bearings operating at moderate speed. BENEFITS : Reduction of wear and, prolonged lubrication protects against corrosion and provides quiet operation of the machine. Release On 88 H High Temperature Grease is a synthetic base grease with good thermal stability along with extreme pressure additives. It is used in bearing and furnace trolleys, bakery machines, foundry and welding machines, roller and plain bearings operating at low speed working at high temperature. It is resistant to oxidation. Does not carbonize. Release - On AS 12 high temperature bearing grease is a refined bearing lubricant used in innumerable mechanical equipment. 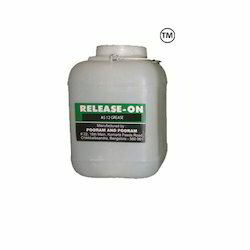 This product significantly it reduces downtime and maintenance. A unique characteristic of this grease is that it does not thin and squeeze out of the lubricated area. It reduces friction and wear. The specialty of this lubricant is that it operates very conveniently with metals of several combinations, while ultimately preventing metal to metal contact. Release - On SPL 48 is specially formulated to withstand very high shear strength. 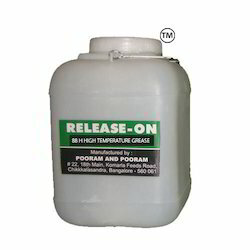 This grease can operate over a wide temperature range. It can be used in plain and anti-friction bearings, and in the hot and cold atmosphere. BENEFITS : This grease is highly resistant to water and prevents corrosion. It can be used for various applications, including machines operated under extreme pressure at elevated temperature. It is compatible with all metals, rubber and plastic.